The Poem Farm: Poetry Friday Is Here! Students - This poem comes from two happenings that have been swirling in my brain this week. The first happening is that I've been working on a new project and hoping that people will feel kindly toward it. The second happening is that our children have been catching Northern rebelly snakes and twirling them around their fingers and hands. Pets and poems. We need to take care of both. And now, a bit of news. I am very happy to announce the title of my second book with Clarion! 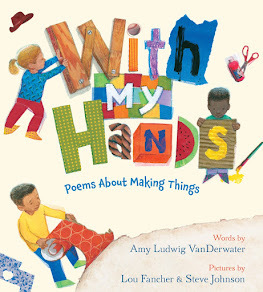 WITH MY HANDS: POEMS ABOUT MAKING THINGS is currently under contract, and I could not be more grateful. I am very thankful to both my agent, Elizabeth Harding, and my editor, Dinah Stevenson, for believing in this collection. WITH MY HANDS is dear to me as I believe deeply in the power of working with our hands, the power of making. I will let you know when this pile of typed poems becomes a real holdable book. 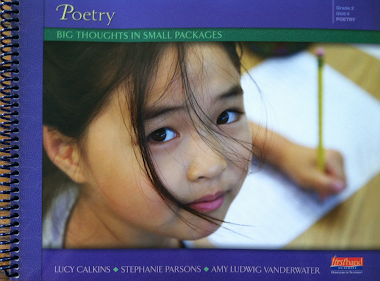 Poetry Friday is a special day for those of us who love poetry and visit it all around the Kidlitosphere each week. This is a time when we gather around to celebrate words and each other. I feel lucky to have good friends in here, friends who enrich my life even when they do not know they are doing so. We welcome everyone to join on in, so please enjoy the links below and feel free to leave your own. Because I will be away for much of the day, I am allowing Mister Linky the pleasure of helping me host. Kindly leave your information below. I look forward to visiting everyone's blogs throughout the weekend. Happy Poetry Friday! Thanks for hosting, Amy. Always enjoy holding your poems in my hands and in my head. Kids are going to love your "Poem Pet" too! Hi Amy, Love the idea of "holding' those poem's words, if allowed! Congratulations on your coming book; it sounds both thoughtful and my mind is swirling about what it might tell us! I too, like Charles, have a post about Autumn leaves, my own-that time of year! Amy! CONGRATULATIONS on your next book! Of COURSE it's about making things with your hands--OF COURSE it is! There is a special tenderness about the pet poem you've shared, Amy. True, clear and so very you. CONGRATULATIONS, AMY!!! I can't think of a more perfect subject for you to write about. I'm so excited to hold your book in my HANDS! WHOO! 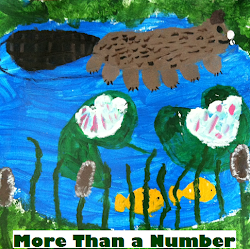 The Mortimer Minute stops by No Water River today for the Children's Poetry Blog Hop. Karla Kuskin is there, too! I absolutely love that idea. I look forward to reading it. Thanks for hosting and holding us gently in your hands. Amy, HUGE congrats! That's so exciting! I love the way your poem transforms a poem into a small, shy pet. Yay! Congrats on your new book -- so happy for you. And I love your poem. As April said, it's very true and very "you." Adorable!! 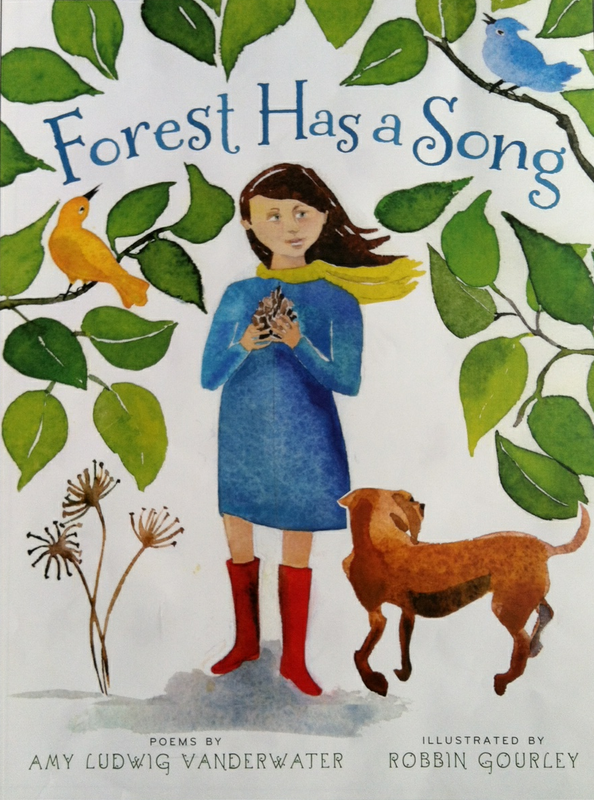 Today at Alphabet Soup I have an interview with Natalie Bober, who has a new picture book biography of Robert Frost coming out next month. It's a lovely, lovely book! Amy, what a sweet poem; perfectly evokes that tender, vulnerable feeling of sharing what we love. At Random Noodling I'm looking at a poetry app. Yesterday was Johnny Appleseed's birthday, and I have an excerpt from a Vachel Lindsay poem. KK's Kwotes has a great little quote from 1919, which describes today! Poems ARE like pets, aren't they? Cute poem, Amy! Thanks for hosting today, Amy, and a big congratulations for the new book - hooray!! Wonderful news!! Huzzah! Thanks for hosting & kicking us off with fabulous news! Amy, what a tender important poem. And so glad for your good news! A new book! I don't even need coffee, hearing that. Thanks for hosting! So excited for you with your new book! I have been making an effort to use poetry more in my classroom this year. Today we did a special workshop with a local university professor about limericks. 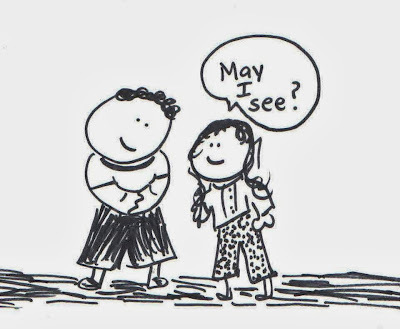 Check out my <a html="http://teachingfourth.wordpress.com>blog</a> to see (and hear!) some of the limericks my fourth graders wrote today! 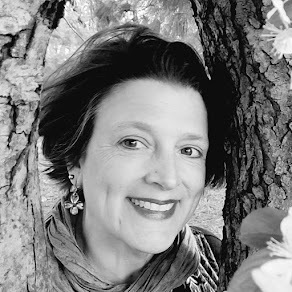 Just for fun, today's selection is "Shrinking Days, Frosty Nights: poems about fall" from the very talented Laura Purdie Salas. Thank you for hosting, Amy. 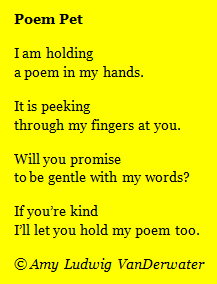 I want to hold your poem! Lovely. Fun to share the space with children's poets. I jump in and out of that mode, singing for children of all ages. Grandmas sometimes have more memories than new events. Maybe you'll catch the tune and dance with me.